I must admit that I just about scrapped the idea of the interior during this latest phase. First the torsion bars are much more fiddly than Dragons, getting everything to line up was a bit of a bear. 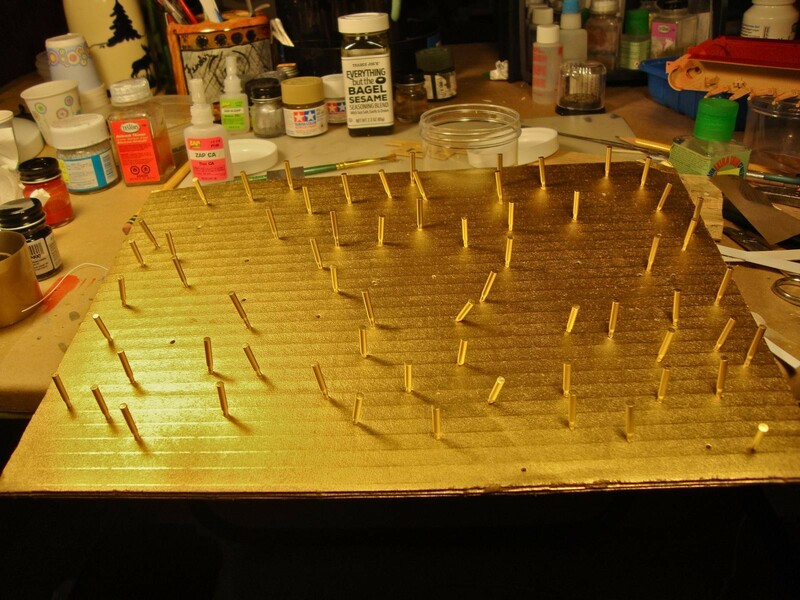 I used toothpicks, which worked well. Next came the PE interior framing. Good Lord! When I was stationed in Japan, my wife and kids learned to love origami, I hated it. No matter how hard I tried my swans always looked like a mangled envelope. My wife and daughters meanwhile made, frogs than actually jumped when you pressed down on their backsides, giraffes, ships you name it. Anyway the PE frame was a bear to get together. I got it, after much swearing. I wisely chose to do it during afternoon “no beer” sessions! 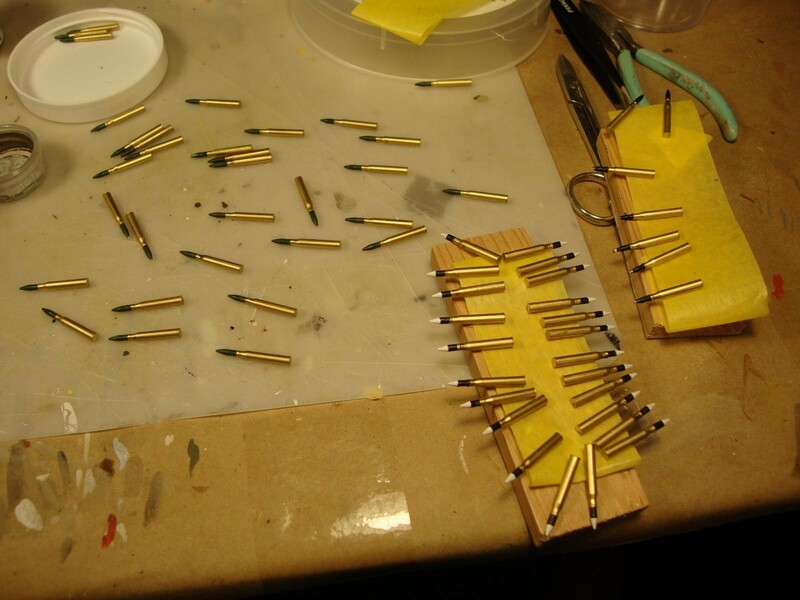 Then came the shells, dozens of them…stuck in cardboard rattle can gold, then each tip hand painted. I am NOT putting the dozens of tiny decals on them. This is starting to be an epic struggle taking longer than the drive on Berlin! I shall not give in though! 10 responses to RFM Panther continues. Plastic modeling , or oragami? 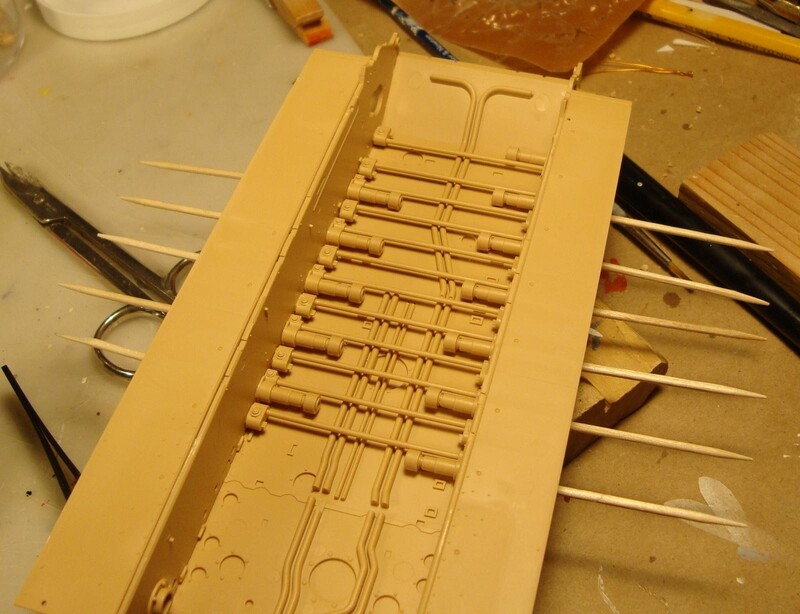 Well, I have it planned so some of the large hull panels that would come off on the real thing are removable, RFM did a nice job of making these separate parts. As for the decals, I plan on using a handful once the shells are in their racks, only putting on ones you can see! And I think that this kit would be fantastic for someone who loves tons of fiddly bits. Me I like a few fiddly bits, that’s what makes Dragon’s smart kits so brilliant! 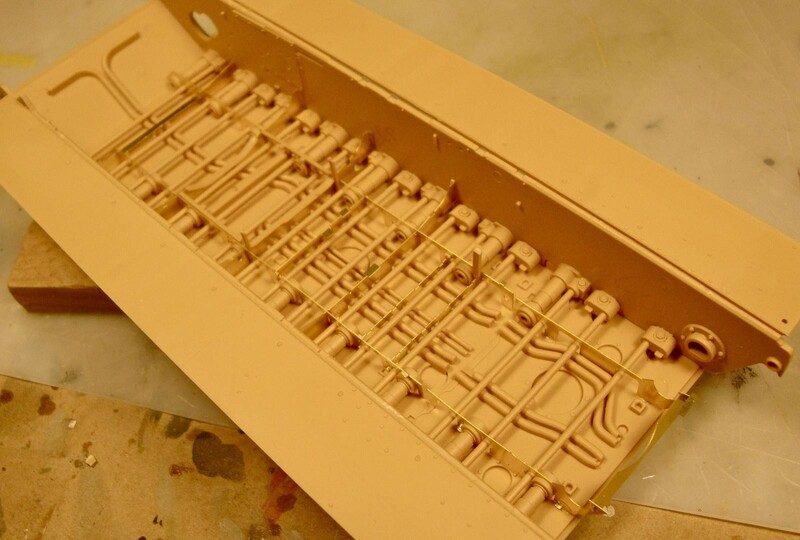 And while we are at it why Monogram dominated the model aircraft world for so many years, fiddly and detailed enough without making you crazy! Better you then me…LOL! U always have the best looking, unique beers on hand and the best collection of mugs. Anyhow back to the model. Great Job Mate! Its looking really cool. I love how u did the shells, nice idea with the cardboard; I will remember that. They came out great. What is “RFM”? Rye Field Models, edited to add: They are a relatively new company and very ambitious. I think as the move along they will improve their product. Don’t get me wrong overall this is a great kit, it just has a few misses. One thing I will say about the company. The rear hull plate was short shot, fixable, but annoying on a $100 kit. I contacted their customer service, and actually got an immediate response and Vicky says a new part is on the way. I have contacted Dragon in the past and never heard so much as Boo from them. That shows they value their customers. They have a new late Tiger I kit out that David Byrden (a noted Tiger expert who worked with Dragon on their kits) gave a very high rating to. I think they get their price point right, clean up some niggles here and there and they will give Dragon a run for their money. They just aren’t quite there yet. 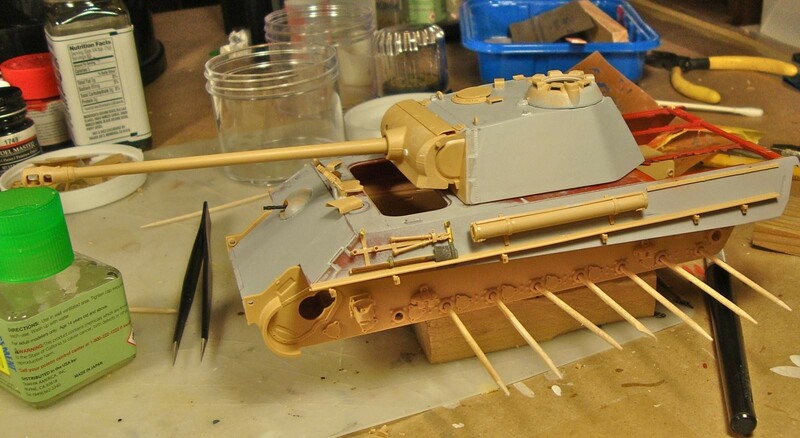 Looks like your Panther is coming right along. I like the idea using the tooth picks. I’ll try to remember that one. 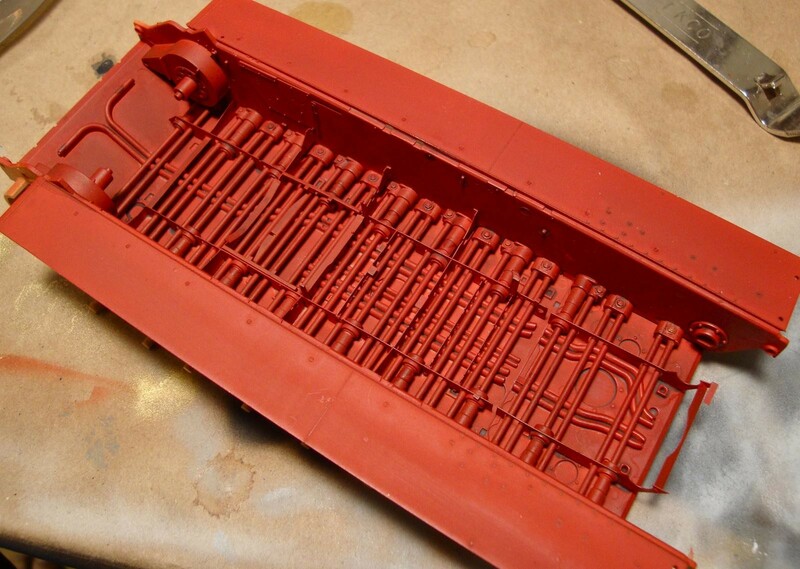 The red oxide primer paint looks spot on…………… I wonder just how close a .223 (or 5.56 Nato) is when compared to a 1/35 scale 88 MM……………. Some empty / spent brass might save some time if they are “close” as far as size wise goes. Yours looks great, and I don’t know if I would add the decals either. Maybe a few and place them so they can be seen in various places ??? I know that when we stored ammo in our tanks, we didn’t care about having the “Lot Numbers” all oriented in the honey combs. They ended up however they did the first time they were placed into the tank. I have a RMF Tiger kit, the “Group Fehrmann” version. Those were some oddball Tigers as some had Zimmerit hulls and none on the turrets or even the other way around. Some had “steel” road wheels while others didn’t…………….I think they were “pieced together” from various bits of several tanks. The kit looks great in the box. Thanks for the heads up about the customer service. Any more these days, it seems to be going the way of the dinosaurs……. and it’s refreshing to hear about a company that actually cares about their customers. A very busy & interesting work-space, Rob. LOL, empty jar I use for laquer thinner! Right-on, Rob. I use small salsa bottles for various modeling liquids. 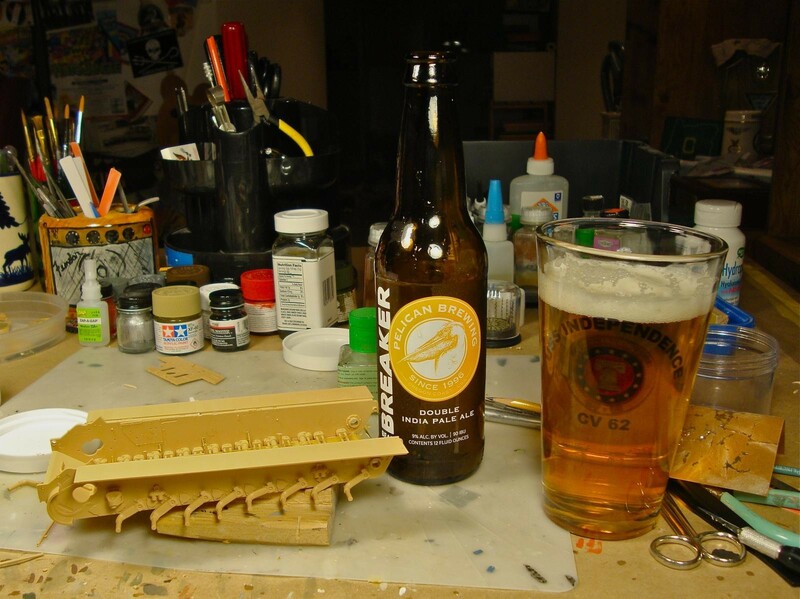 Well – I’m glad there are folks with patience like you, to build targets for aircraft builders like me!! Coming along nicely, despite the foibles of the kit.